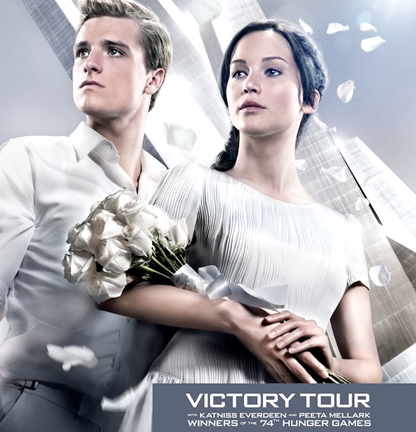 The movie adaptation of The Hunger Games took the world by storm last year. As the legions of fans eagerly await the sequel, Catching Fire, there is no end of promotion for this franchise, and rightfully so. Following in the footsteps of Harry Potter and Twilight, the Hunger Games trilogy (or possibly quartet), is wildly popular, but for different reasons. It has introduced one of the strongest female characters in decades and, in addition, it delivers a genuinely dramatic and gripping story that can sit proudly beside works of dystopian fiction such as Orwell&apos;s 1984 and Huxley&apos;s Brave New World. In fact, much like these two classics of the genre, The Hunger Games is more than just a story — it&apos;s a dismissal of the very celebrity worship that is being used to sell its film adaptations. Author Suzanne Collins&apos; stories deliver a fantastic and well-crafted rebuke of the modern infatuation with celebrity and the world&apos;s near-addiction to reality TV show. Surprisingly, for a young adult thriller, the series is a lot more than a fanciful love story or a Michael Bay action movie. It has a substantive critique interwoven through it, which is why Lionsgate Entertainment has so badly missed the mark in its promotion. Perhaps most glaring in these attempts is the European tour on which the actors have embarked. In much the same way as the Capitol used Katniss and Peeta for propaganda purposes by carting them around the districts in the Victory Tour, Lionsgate is selling its movie by carting the actors around Europe for the premieres. While this isn&apos;t anything new for the industry, the problem comes from the source material. When a company markets a film that is a direct critique of celebrity worship, it neuters the film it promotes. Perhaps if it were just the European tour alone, this wouldn&apos;t seem like such a huge oxymoron. Unfortunately, as another way of reaching out to the fans, The Hunger Games Explorer website is plastered with pictures of Jennifer Lawrence. In fact, with cast pictures, videos, and rewards offered for helping promote the movie, the site itself is bordering on a reality event. This is paralleled in the Hunger Games themselves as the focus on the training and "pre-event" serves to focus the entire nation&apos;s attention on the games themselves. Capitol Couture cosmetics from Cover Girl tip the scales pretty far towards ridiculous. There&apos;s a clear irony that the Capitol fashions are being used to promote a story that is so opposite everything for which the Capitol stands. The Capitol denizens are the height of celebrity and voyeuristic culture, whereas Katniss is a strong female character who isn&apos;t concerned about the frou-frou fashions that the Capitol fashionistas have her wear. She wears what is needed to get the job done, and that is a great source of strength for her character. 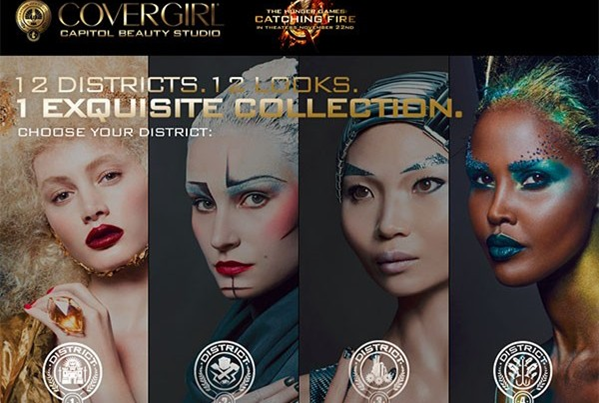 By tying these cosmetics to these characters, Cover Girl is dumbing down the strength of Katniss and the other female characters. With all of the social media and celebrity worship in our culture, it&apos;s distressing that there is no better way to get the message of The Hunger Games across, but that seems to be the industry standard now. Strength of sales is often tied to the star status of the main actors. Maybe by working within the system, The Hunger Games has a chance to make people think. Maybe, but if the books weren&apos;t able to do it, I doubt it.